Let me set the stage for you, 110 degrees, 90% Humidity and smelly. That was New York City for the past week. Unbearable basically. There was a massive heat wave and let me tell you something, it was wreaking havoc on my beauty regimen. Fortunately, my skin has been in tip top condition because I could not wear a stitch of makeup as it was SO hot I literally didn't want anything on my face. All I have been using is lip balm, a swipe of mascara and my secret weapon of choice, Caudalie Beauty Elixir. How I love thee! It saved my life this week. How so? First of all, it is very cooling and refreshing, it is in a spritzer bottle so at that time of day when I am so overheated a good spritz of this and I instantly feel better. It also smells amazing. It is smells reminiscent of an herbal scent, something lavender-y and minty. Additionally, when sprays it leaves a glow. No shimmer, no sparkle, just a glow from hydration. My favorite part about it, it is completely paraben and synthetic chemical free! This product is described as part toner, part serum mist of essential oils. Sign me up! I picked mine up in Jackson Hole, Wyoming, but you can pick it up at Sephora for $16. It even has their seal of natural approval. Win Win! This is a staple in my bag for those hot summer days! omg! i absolutely love this stuff, its even great on top of makeup, and when you using powders it gets rid of the powdery look and leaves a certain glow about about your skin - though im shocked at the price difference, here in the uk this fabulous prod cums with a hefty price tag of £36!!!! 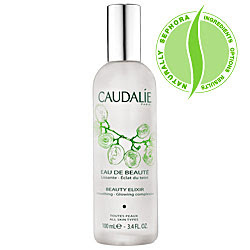 I love Caudalie and the beauty Elixir smells so nice! :) I also use its sun protection creams. they are very very good. The beauty elixir is great. I also love their grape water mist for the same thing! They have such a great line - I use their gentle face cleanser and the complexion correcting radiance serum! omg i picked this up a couple of weeks ago because i absolutely looooove having face spritzers that i can carry because of traveling and weather changes...plus my skin is dry and sensitive. the smell of this is amazing! I love this stuff SO MUCH! My mom turned me onto it a few years ago and it's definitely a must-have! sounds like a great product. But I'm being put off with oils in it. Has anyone with a combination acne-prone skin tried it? What do you think? oh, yes Caudalie is a great brand! I love their eye cream a lot, it's amazing. I have this ...very refreshing. Glad I picked it up. I do want to try this but more than likely use it after my lunch hour gym workout since the weather has been well in the low 60's here in SF. I wonder how it would look on top of my tinted moisturizer. their radiance serum is also great, musthave!